If you're a fan of hyperrealism, then prepare yourself for a groundbreaking collective show at London's Opera Gallery this December. Beyond Reality, which kicks off on 13 December, will feature world-leading hyperrealist artists, including internationally acclaimed Marc Sijan, Tigran Tsitoghdzyan, John Humphreys, Yigal Ozeri, and Mike Dargas. 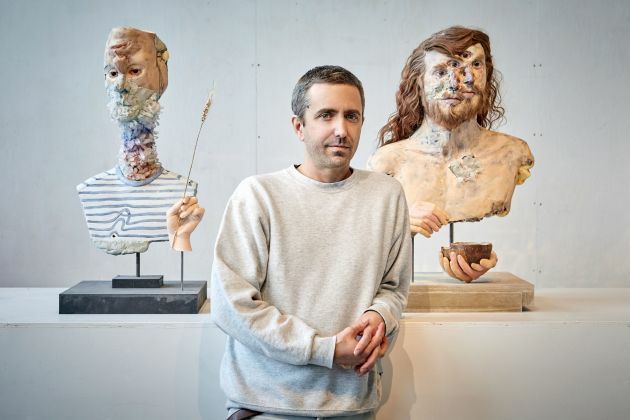 From life-like sculptures to paintings that look like real photos, the exhibition will feature artworks that challenge you, making you question whether what you're looking at is art or real life. A creature designer for Dr Who and sculptor for Charlie and the Chocolate Factory and Alexander, London-based John Humphreys is an expert in special effects and makes sculptures that are disturbingly close to life. He also created the Alien for Alien Autopsy, the black and white film that launched worldwide controversy around the "UFO incident" near Roswell, New Mexico, and inspired the TV series, The X-Files. Italian artist Valter Adam Casotto has been a prosthetic makeup artist for over 20 episodes of Game of Thrones, as well as Harry Potter and the Deathly Hallows (the Gringott goblins), The Hobbit (Bombur, Kili and several Orcs), Tale of Tales, and X-Men: First Class. He produces unflattering portraits and life-like creations that look so real they seem almost on the verge of movement. Mark Sijan’s hyper-realistic sculptures of humans are exceptionally natural. They are the result of dexterous and painstaking work, and focus on the overlooked, invisible figures in society (cleaners, butlers, security guards), as a tribute to real people. World-renowned painters Tigran Tsitoghdzyan, Mike Dargas, Michael Moebius and Yigal Ozeri blend portraiture and hyperrealism, using their remarkable pictorial expertise to invite us to take a closer look. Meticulous trompe-l’oeil paintings of Nicolae Maniu and Lee Jung Woong, while rooted in hyperrealist practice, add a touch of Surrealism and humour, with hints to the artistic production of Salvador Dalí and Jackson Pollock. "We wanted to have a playful exhibition, with works that anyone can access and engage with," explains Federica Beretta, Deputy Director at Opera Gallery London. "Beyond Reality will exhibit art by emerging artists as well as world-leading and acclaimed masters in the field. These days there seems to be a great appetite for skilful artists, who question the way we perceive art thanks to their unparalleled craft." Beyond Reality will run from 13 December until 28 December 2018 at Opera Gallery London. Find out more: www.operagallery.com.